The kitchen is too quiet. Normally making dinner involves a coordinated shuffle of bodies in the 3 ft x 6 ft space I can call my kitchen. Tom switching between the sink and the fridge, me between the fridge and the stove. We can barely fit two people in there at once, but the playful dance we enact every night has been dearly missed. Now, when I notice the sun getting low on the horizon I wander downstairs in search for an easy and healthy dinner for my daughter. Anything healthy that she will eat with minimal complaint. As for myself, I pick at what’s in the fridge. Maybe some carrot sticks, pita bread and tahini, a few slices of tomato with salt and pepper, some deli meat or sautéed chicken breast on top of a garden salad. In my world, Tom is the person who gets the two hour long elaborate meals. He is the one who gets the cakes, the brownies, and tries all my kitchen experiments. Our daughter wont eat most food so without him I have no one to cook for. Without him my kitchen is a very lonely place. A few days ago I decided that we couldn’t go on like this for another 6 weeks. I would use this time apart to make things my meat and potatoes husband would not appreciate, stuff I would like to try out, like vegetarian food. There are so many meatless options that I have not had the chance to experiment with. Beans and lentils, nuts, seeds, tofu, stuff like that. I’ll share some of my discoveries with you over the next month. Another goal, while Tom is gone, is to get my daughter cooking in the kitchen. In preschool she was obsessed with making potions. She would steal spices from the spice rack on the counter, makeup, lotions, and shampoo from my bathroom, and whatever else she could find around the house to make her special potions (poisons & medicines are out of reach for her, even with a chair). You know those times when you’re getting things done and suddenly you realize that the reason you are getting things done is because the kids are being too quiet? Often you know just where to look. I would head straight for the bathroom where I would find my little wizard combining conditioner, cinnamon and garden soil into a beauty potion for her doll’s hair. I used this to get her in the kitchen. “Cooking is just like potion-making, little wizard. You have your list of ingredients, instructions on what goes in the bowl cauldron, and how to stir it. All you need is a chant.” I broke out my best hag voice. She finally agreed to help make it, but was firm in her opinion that she would hate it. It felt good to have her in the kitchen with me, grouchy or not, the kitchen is not supposed to be a quiet place. It’s where sacred family recipes are whispered to kin with vows to never to share them, where children beg for treats and where the whole family gathers around the table to ease their rumbling bellies and share the events of the day. I imagine myself at an advanced age, looking back on my life through the lens of my kitchen. Trading recipes for enchiladas with a friend at my table, the whispered marriage advice that was given while cooking over the stove, the joyous celebrations with those who have become closest to me, and the mealtime dance of Tom and I every evening in our tiny kitchen. Did you know we were even married on the threshold of our kitchen? The kitchen has a living pulse within it, a spirit of giving, sacrifice and devotion that follows our family from one place to the next, growing stronger and more powerful as our table fills with family and friends. I started her off smashing bananas, because it’s always fun to smash things at any age. 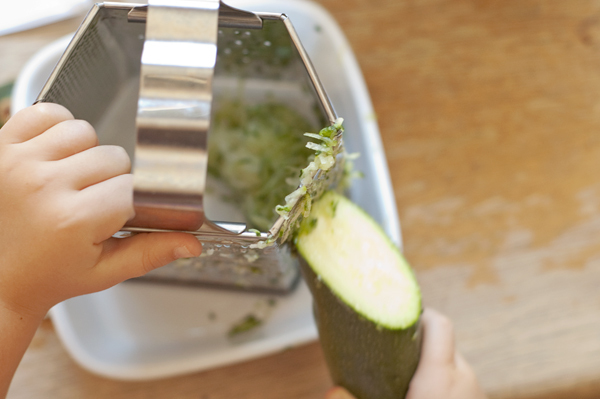 Then we moved on to learning how to grate a zucchini without grating her knuckles at the same time. We discussed why adding the dry ingredients to the wet slowly would stop the flour from flinging across the room. Of course, that happened anyway. We talked about why she cannot eat the batter covered chocolate chips out of the bowl, since salmonella is not your friend. 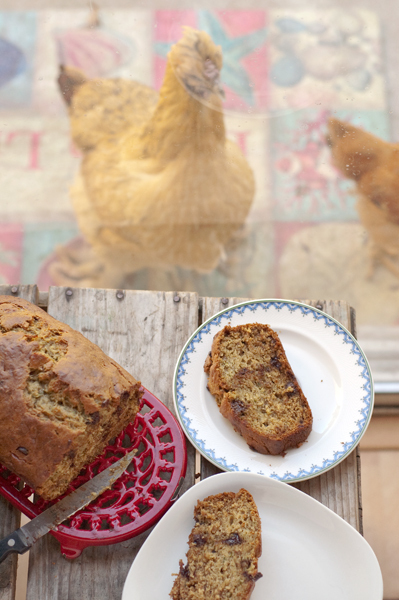 And why banana zucchini bread is not a good treat for the chickens even though they want to try it so badly. After her first bite she declared this bread her favorite and harassed me about having more pieces for the next two days, until it was gone. Another one for the recipe box. 1. Preheat oven to 350. 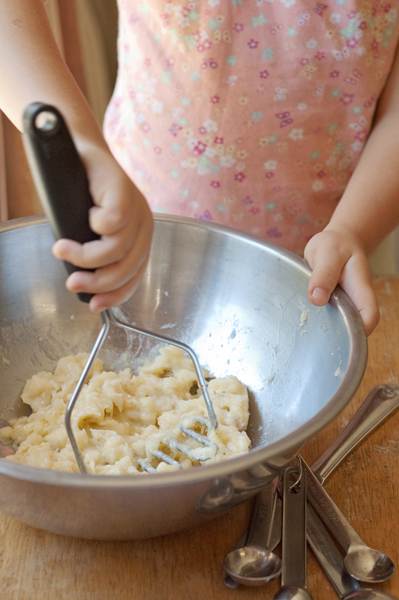 In a medium bowl mash the bananas with a potato masher or fork. 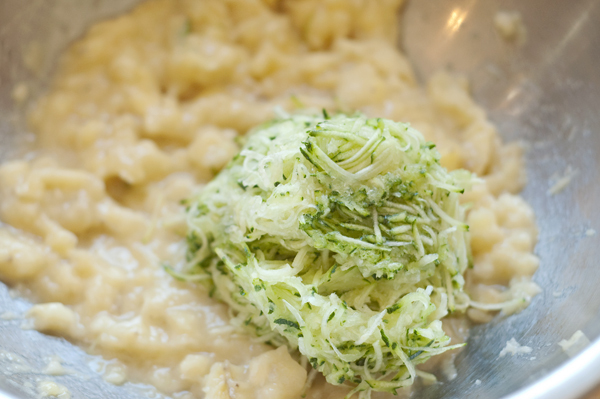 Add the shredded zucchini, sugar and egg. Mix well. 2. 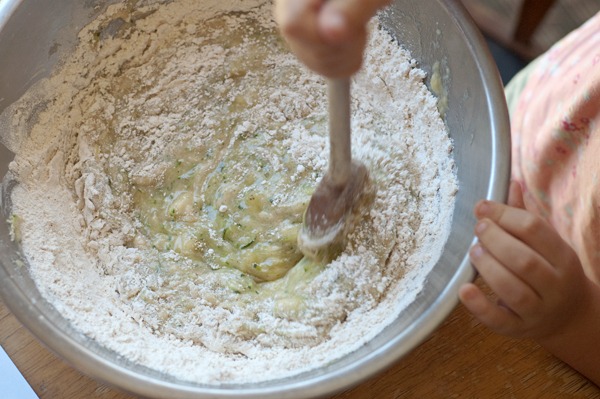 In another medium bowl mix together the flour, baking powder, baking soda, salt and cinnamon. Gradually add the dry mix to the wet mix stirring until well combined. 3. 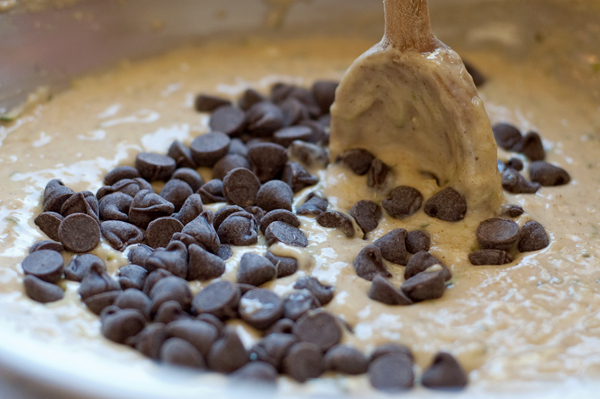 Stir in the melted butter then add the nuts and chocolate chips. Pour into a greased loaf pan and bake in the oven for 1 hour. 4. Check for doneness by poking the center with a toothpick. If it comes out mostly clean with a couple of crumbs hanging to it then its done. If its covered with wet batter then stick the bread back in the oven for 5-10 minutes longer and check again. When finished let the loaf cool in the pan for about 10 minutes before removing. To remove, place a plate on the top of the pan and then flip the pan and plate over together so the bread is upside down on the plate. Slowly free the bread from the pan then roll the bread right side up. By the way, if you cut the loaf into 8 slices, each slice has only 330 calories, with 5 grams of protein, and 7 grams of fat. Plus some veggies and fruit. You could cut yourself a slice for breakfast, snack or dessert. Welcome to my blog! I am glad you like it. I would love to know how your bread comes out. I’ve shied away from zucchini in just about anything. 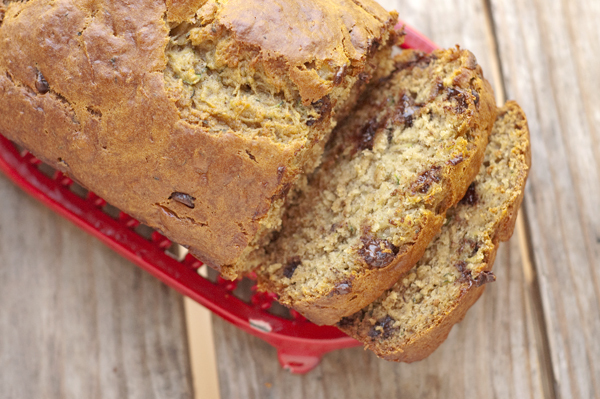 But I do love a banana bread, especially one that has chocolate in it, so I think this is a good place for me to start with zucchini. The photos look too beautiful to resist! 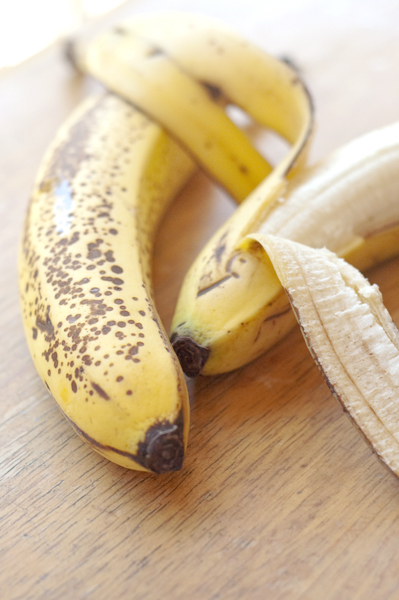 Perfect combination of zucchini and banana. Looks delish. This looks so good! 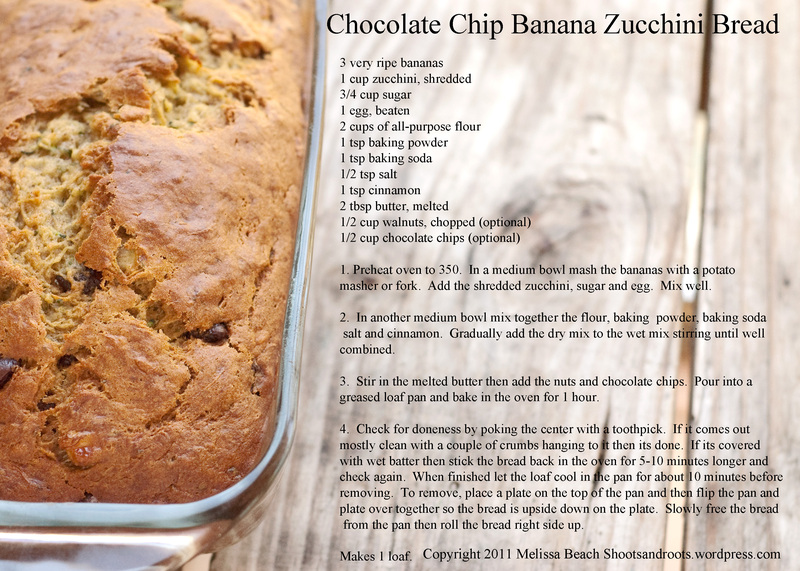 I have a bunch of ripe bananas and a zucchini just begging to be used, so I’ve been trying to find a good recipe to combine the two. Can’t wait to try this out! Thanks! I would love to know how you liked it! Looks awesome, and your blog is beautiful! Taking pictures of food is such a skill, and one that I do not yet have. I may borrow a couple of your pics if you don’t mind – I will link back of course. And I’m bookmarking this recipe for sure! The last few weeks I have made cranberry bread and banana bread. Not sure if it is the winter that is influencing these cravings. 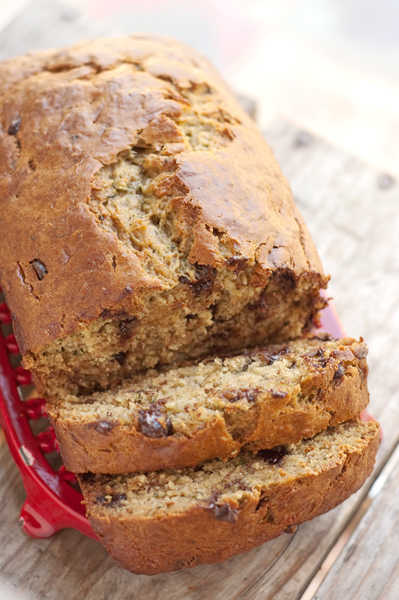 I just happened on your blog after searching for banana, zuchini bread and found your entire entry really lovely. Very well presented and I love that you are starting to cook with your daughter while your husband is away earning a living. My daughter cooks all the time with my almost-3 year old grandson. In fact, the cooking sessions with him are generally his most focused time of the day. Over the Christmas holidays he actually stood along us tempering chocolate and dipping truffles for almost three hours. I hope to make this bread recipe today and hope it looks as good as yours. Thanks for posting and good luck with your blog. I am signing up for updates. Thank you! I am impressed your grandson is helping with chocolate! That sounds like a photo op for sure 🙂 Hope you like this recipe. Be sure to let me know how you like it! It was terrific. The chocolate chips are not on my diet, but I cheated and ate two pieces already. Looking forward to seeing all your recipe posts and photos. Thank you so much for this recipe. I made it last night and it turned out great! The bread is so moist and delicious and it made the house smell wonderful. My husband said it was the best bread I’ve ever made! I will definitely be adding this to my recipe book. Made these tonight, but since I don’t have a loaf pan I used muffin tins lined. I substituted coconut oil for the butter. These are amazing! I’m glad I stumbled across this recipe today! Thank you for sharing!!! Looks yummy, but I am surprised there’s no butter or oil in the recipe. I usually make banana bread and my favorite recipe has 1/2 cup butter and two eggs. Would this recipe benefit from adding stick of butter, or does the zucchini provide the needed moisture and texture butter would give? I just noticed there are 2 Tbs of butter in the recipe – still strikes me as very little, no?